The city of Toronto is trying to brush off the title “Raccoon Capital of the World” that the PBS show Nature bestowed on it this week. I called the See Toronto 800-number and asked where animal tourists could see raccoons. The Toronto travel expert tried to dissuade me that they even have any. They clearly have seen the documentary “Raccoon Nation,” and don’t want to be known as some kind of planetary dumpster that draws masked nighttime scavengers. Oh, they’ve seen the stories. The documentary premiered on Canadian TV last year and highlights the York University research tracking urban raccoons, which shows they live 150 per square km–50 times the density of rural raccoons. Researchers found that, like human city dwellers, urban raccoons just get used to living in a smaller space and don’t stray outside it, even if there are green pastures nearby. They’re like Manhattanites with a mental barrier that keeps them from the attractions of Brooklyn and the suburbs. Sadly, there is no official raccoon census to gauge whether Toronto deserves the title or just happened to get it because they have raccoon scientists. If you’ve ever walked in Central Park’s north woods at dusk you will be amazed how many raccoons just pop out of the trees. The documentary points out that Kassel, Germany, is the raccoon capital of Europe. They don’t mention that they are sometimes called “Nazi raccoons” because they were released with permission of Hitler pal Hermann Göring, who figured he could improve on the genetic diversity of German wildlife and make the forest more fun for hunters. Japan imported them as cute pets in the 70s. Guess how that worked out. They’re now turning ancient temples into dens. Russia also has a runaway raccoon population. 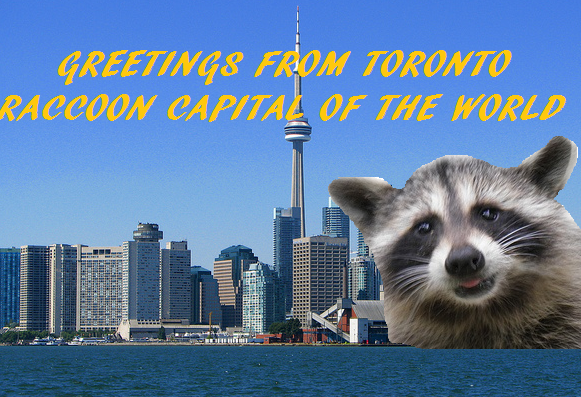 Toronto has some competition as the raccoon capital. Florida’s Hugh Taylor Birch State Park in Ft. Lauderdale had a documented population of 238 raccoons per km. Well, it did before people caught and moved them–though the park still notes that it’s a good place to see them. Out Walking the Dog has estimated the raccoon population of central Manhattan’s parks is north of 400. Odds are, someplace in the world has a greater density of raccoons than Toronto. If they want to shirk their title, they should try figuring out what that place is. Will NYC Get an Official Wildlife Care Center? Re: the remark supposedly made by a “Toronto travel expert” at a See Toronto 800 number that he/she has lived in Toronto all of his/her life and has never seen a raccoon would be possible only if this person has been in a coma all of his/her life!